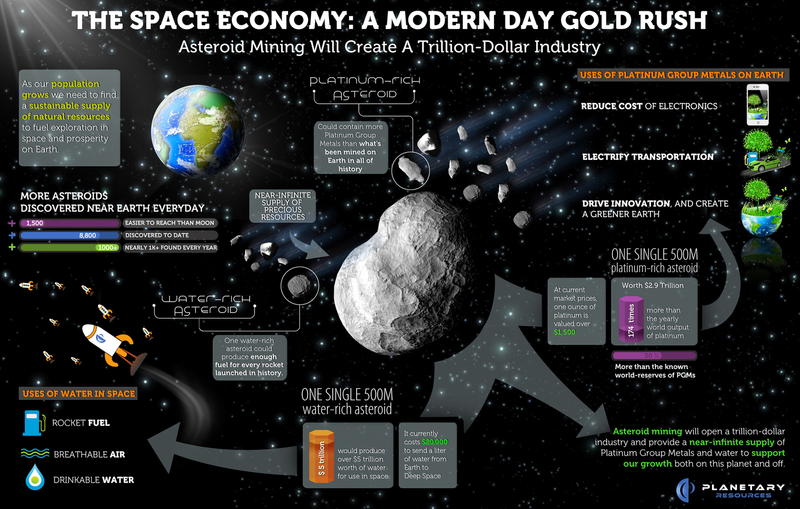 Coal miners mine coal; diamond miners mine diamonds; gold miners mine gold; space miners (will) mine space—and anything in it that has precious metals or compounds that can be whisked into rocket fuel. But, just like the first three kinds of “resource extraction,” the celestial kind will face more than a few philosophical, financial, and regulatory complications. On November 24, President Obama signed the “US Commercial Space Law Competitiveness Act” into law. Among other things (like that the government should not pester SpaceX), it states that any US citizen who takes a chip off an old block of asteroid then owns that chip. The law also applies to other celestial bodies blessed with “resources,” like the Moon and every other planet and lower-case moon because “resources” is a vague word. The US citizen—or, more likely, a group of citizens who are part of a company, like Planetary Resources, Inc., or Deep Space Industries—can then “possess, own, transport, use, [or] sell” the resource. The leaders of the two asteroid-mining frontrunners, who hope to extract things like precious metals and water from space rocks, spoke excitedly of the development. "A new life awaits you in the Off-world colonies! A chance to begin again in a golden land of opportunity and adventure!"